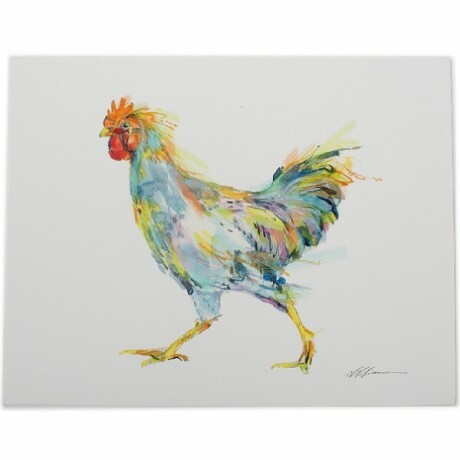 This friendly (& colorful) chicken is the perfect addition to your home! Suzanne Simmons is an extremely talented illustrator working for over 40 years as a fashion illustrator with major brands and advertising agencies. Suzanne’s daughter, Annie, wanted to fill her home with a certain style of artwork and couldn’t find it. Annie began a collaboration with her mother and Rainy Day Illustrations was born, their goal is to create artwork that highlights the beauty surrounding us every day. Watercolor prints are on Hahnemule William Turner 190 gsm, 100% cotton paper. This fine digital art paper has a distinct textured surface and maintains the vibrant colors of the original painting. Available in 3 sizes!